If you’re like me, you’re still sifting through the wreckage left in the wake of last Friday’s bombshell report regarding Kyrie Irving. What had already been a mercilessly chaotic summer for the Cleveland Cavaliers somehow got even worse when word broke their star point guard had demanded to be traded. As more details trickled in, the story only became more confusing. 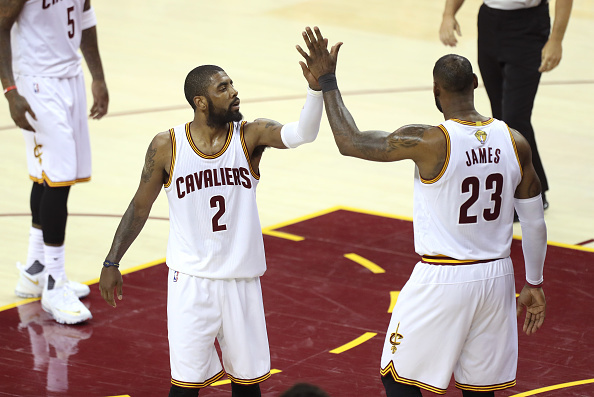 Irving’s request was stemmed in a desire to become a focal point elsewhere, as he’d apparently grown tired of playing alongside LeBron James. Such a thought process seemed insane on the surface, considering the fact the Cavs have been to three straight Finals, winning one. Since then, it appears Cleveland has become hell-bent on granting Irving’s wish, attempting to work a blockbuster trade to send him packing. The team even went and signed former MVP Derrick Rose, seen now as the eventual 2017 starting point guard. While this situation continues to develop, there has been faint hope of a reconciliation between Irving and James. Many spoke of Kobe Bryant‘s famous trade demand in 2007, which concluded with him staying put in L.A. Perhaps Irving was just caught in a moment of frustration and, with time, he and James could make amends and prepare for the 2017 season in Cleveland. As this saga continues, this potential outcome becomes more and more unlikely. Whether it be via social media, developing reports or the Cavs’ continued trade discussions, evidence certainly implies Irving and James aren’t going to be making amends any time soon. For one, we were all notified soon after news of the trade demand broke that James had no intention of stepping in to assist the front office. While this was meant to be read as his not providing insight on trade offers, it also indicated he wasn’t going to be relied upon to try and hash things out with Irving in attempts to convince him to change his mind. If Irving’s demands are based on wanting to get away from playing with James, it’s tough to believe this will change if the latter shows no interest in patching things up. James is clearly not going anywhere, and he’s going to remain the priority in Cleveland whether Irving likes it or not. In the time since this news broke, Irving has remained silent, Snapchatting from his Nike tour overseas. In one specific post, he appeared to take a jab by singing “Coming Home,” a song often used as a backdrop for James’ return to Cleveland. This followed reports claiming everything from the Cavs telling Rose they planned on not having Irving around next year to James apparently being willing to fight his former point guard. As the social media nonsense continued, more and more stories have developed regarding Irving’s unhappiness in playing alongside James. Numerous reports claim his issue with being in James’ shadow has been simmering since the superstar’s return in 2014. Fans seemed to attach themselves to some hope yesterday when James went on Twitter to seemingly debunk stories about a nasty rift between himself and Irving. However, it’s still tough to believe this was some attempt to extend the olive branch. It seems a little more realistic to believe James might be trying to help the Cavs by making it seem as though they’re a little less desperate to get this over with as soon as possible. Other teams may have felt they had leverage when the assumption was Cleveland had to get Irving out quickly or risk some sort of training camp fight. The problem is, while James attempts to deflect, more and more evidence arises pointing to this situation hitting the point of no return. Even today, we’re hearing the Cavs are hell-bent on moving Irving, provided they receive an appropriate offer. So, while Cleveland fans can hold their breath and root for this to end happily, for Irving and James to make amends and work together to help the Cavs try and win another championship, this fantasy gets loftier by the day. Both players appear to be acting as if they won’t be teammates next year, while the front office continues to work the phones for a good offer. Barring any sort of miracle, it appears Irving has done more than enough work to burn the bridge between himself and Cleveland. As a result, I wouldn’t invest too much hope on his having a change of heart anytime soon.